Tagged accreditation, Michael Gottfredson. Bookmark the permalink. Has Scott Coltraine’s performance ever been reviewed? I assume his past performance as dean was a factor in elevating him to acting provost. Was the judgment of his past performance based on an objective review, as is required every three years of every administrator? Or did he continue the grand tradition of Palm, Stone, etc and avoid any evaluation of his performance? Yes. He was very thoroughly reviewed just this year in a public process that collected feedback from many different constituencies. Thanks for posting this Joe. So the names of the prof that conducted the review – like the review itself – are a secret, known only to Joe Stone, that he reveals at his discretion? I wish my course evaluations worked on the same principle — email me and come to my office if you want to see them. Who chaired Coltraine’s evaluation? When do we see the results, or do we rely on statements on U o O Matters? Do we need his permission to find out what they said? Don’t give me the usual BS about confidentiality. Any prof’s student evaluations are publicly available. 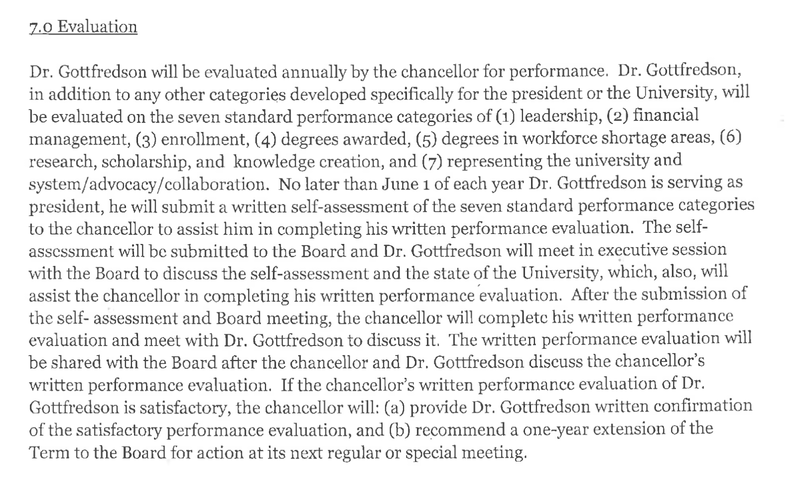 Are you talking about current UO President Mike Gottfredson’s secret review? Because you raise some interesting questions about faculty input. Gottfredson might want to keep the review results secret – I can’t imagine why – but the names of the people who were asked to provide input, and the questions they were asked, must be public records. I’m happen to make the request for them, if you’re not willing to do it yourself. Or are you just trying to change the subject from Gottfredson to former CAS Dean Joe Stone, who stepped down years ago? I am raising questions about the current practice. Risa Palm resigned rather than undergo an open review. Since then, admn, when they have submitted to reviews, which is seldom, have done so under the cloak of secrecy. This is in contrast to previous practice; Myles Brand underwent a complete, open review of his performance after three years, with the results published in the Emerald. So, I guess in Joe’s case, if I email him, go to his office, he will divulge the names of the people that conducted the review. Thanks, Joe – why all the secrecy? Yes, the issue is Gottfredson, but more than that the current practice of adm reviews. Why doesnt Joe join us in asking that all of this be a matter of open public record, as it is at other universities? OK, I’ll go ahead and ask Chuck Triplett at OUS for docs on their procedures for the Gottfredson review. For Coltrane et al., there’s a Senate resolution and a policy under development on how JH reviews administrators. It was my motion, I’m on the committee, a report will be presented to the Senate in the fall, and I’ll keep people posted. So Coltrane got reviewed with faculty input, but not Gottfredson? Weird. Coltrane’s review was mostly positive but not exactly stellar. typical for any UO admin over the last 20,30,40,50, 137 years? To UOM, sounds like a good plan. Go for it. Now to saturday Earlier anonymous (EA), (EA) made a false claim anout me by name on this blog that I was not reviewed as dean, but prefers to attack again and distract attention away from the fact that the claim was false rather than simply admit error and move on. Call me stupid for engaging again. The review committee and reappointment process were all publicly announced at the time. The review committee was never a secret, but IMHO it is neither my place nor EAs to drag names out on this blog years and years later.To what purpose? other than to grind EAs axe on a long-departed dean. Some are now retired after many years of service, including me. In the midst of all the current difficulties, I doubt anyone else really cares now, As for EA’s call for me to state my position on reviews of administrators, I’m retired, and excuse me, owe EA nothing. I responded initially only to call out the false claim that mentioned me by name. I doubt anyone else really cares. That said, you may note if you choose, my endorsement of the UOM ibitiative at the beginning and my long-standing position in support of requiring reviews on the now standard, 3 and 6 year schedule for all CAS faculty, including administrators, which was codified in the CAS faculty handbook at my own personal initiative and in consultation with faculty. Now, EA, please permit me a peaceful retirement. Thank you. The issue, as I said in post 8/3, is current practice. It is not Stone’s performance as dean, about which, I agree, no one cares. The requirement for reviews of adm was in place long before Stone tinkered with the CAS handbook; it was just ignored. I was not aware of his strong feelings about adm reviews, anymore than I was aware that he had been reviewed himself. He certainly did not speak up during the debate over Risa Palm’s evaluation (he was her assoc dean at the time), nor did he speak up over the calls for Frohnmayer’s evaluation. But I agree, let’s move on. When do we see the results of Coltraine’s review? To me its not the issue of anonymity, secret views, etc, that I find questionable but rather, its the pro-forma nature of the reviews. In my experience a) they are not critical views b) the criteria is mostly pablum c) idiosyncratic rather than systematic reposes usually dominated and d) faculty involved are usually timid. For Coltrane at least the survey part of that review had some decent questions but the response distribution was not given much attention. Risa Palm, who introduced the three-headed deanlet (thus serving to further polarize CAS in my opinion) that review would have been only slightly less negative for her than Tomlin. But, and this is the part not done – a criteria needs to be developed for defining “better off” or “worse off” and we just don’t bother with that here and/or make excuses/rationalizations to ward off direct criticism. Is the UO better off or worse off than it was say, in 1995? 1. Do we have a better and more fair budget model now than then? 2. Have we produced new degree programs that better engage students now than back then? 3. Is the football team better? 4. Are UO faculty treated better by JH now, compared to then? 5. Do we have better teaching facilities now, compared to then? 6. Is your faculty pay comparatively better now, compared to then? 7. Is there increased functionality within CAS (and the other units) now compared to then? Well its Sunday and this is a sermon – my view is that any time over the last 20 years the UO always claims its excellent by confusing, deliberately, mediocrity with excellence to avoid confronting real issues.